Gold Size adhesives, adheres Gold Leaf. 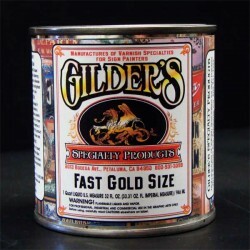 Buy what Pro Gilders use Oil, Water and Alcohol gold size. where to buy gold-size? Here where the professionals get their gold size. Always make test samples to know your products behaviors and to have samples for future customers or for reference. Gold Size-Oil based, used for attaching Gold and Silver leaf when gilding surfaces such as Glass, Wood and Metal. Oil based Gold Size produces a satin glow which is visible up to 90 percent of the time. Gold Size-Oil based nowadays comes in a variety of dry and setup times. Fast gold sizes produce a dull satin gild, while the slower the gold size is, the brighter the gild results are. Slow Gold Size stay "Open-tacky" longer and you will have a longer period of time attach gold or silver leaf. Gilders used to mix their own chemicals for gilding and with gold size they started with Fat Oil made by rendering down animal fats in a low heat, then stored typically on a roof over the Summer too thicken, stirring the fat a couple of times a month over 3-6 months. Pure Fat Oil mixed with varnish made from damar pitch(resin) and wood grain alcohol or turpentine(thinners-reducers) to speed up dry time and to add strength-flexibility. Do not confuse strength-flexibility with longevity, pure fat oil size has the great durability over time and is why it is used for capital Domes and Statues where the public won't touch. Gold Size with a greater volume-amount of varnish is considered faster. Fast Gold Size is made to dry faster to get the job done in a rush or to be ready (closed-size) sooner for clear coat finishing. Diamond grade Gelatin: mainly used for Reverse Glass gilding. Least likely to leave "snail Trails" or what are Gelatin veins-fissures. Industrial grade Gelatin Capsules: Lowest Grade, mainly used for Reverse Glass gilding. More likely to leave "snail Trails" or what are Gelatin veins-fissures. Clay Bole Red, Ocher or Gray, are Clay Pigments blended with powdered Rabbit skin glue, some also containing powdered shellac. Bole is painted onto surface, then when dry, may be activated by applying "Gilders Liquor" a 50-50 mix of water and alcohol to active the rabbit skin glue in the mix with the water and the alcohol to activate the shellac, the clay pigments act as a primer-filler in rough cut areas of texture while the clay color provide a colored under-base in case of cracks or flaws in your gild. Once activated, the bole will be ready for gold leaf, if the bole . If it dries out, simply wet again and continue to gild until finished. Now dust off scewings or scrap dust and you end up with a satin finish or you may take the next step with a smooth stone Agate Burnisher and polish down all of the gild to end up with a bright chrome-like finish. Instacoll Gold Size-Alcohol based, a two-part gold size system for exterior gold leaf gilding and interior leafing with gold, silver, and composition leaf. A super-shine or mirror gloss finish is achieved without agate burnishing. After Instacol has dried completely, apply the Activator to the area ready for gilding. Let dry and apply the leaf. Reactivate as necessary. The ultimate mirror gloss is obtained when gilding on a completely smooth surface with genuine gold patent leaf. may be discontinued. 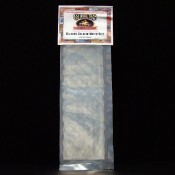 Gilders Quick Rubbing Varnish Gilders Specialty Product's Quick Rubbing Varnish. A traditional alkyd resin quick rubbing varnish of the hig..
Gilding on Glass Wood Metal Book Gilding on Glass Wood Metal a Gold leaf Application Techniques and how-to book by E.C. Mathews and Lawrence S. ..
Japan Color-Brush Size 1-1/2"Japan Color-Brushes Size 1-1/2" are made with Black Goat Hair and a plain lacquered handle designed by Rick Glawson. ..
Japan Color-Brush Size 2"Japan Color-Brushes Size 2" are made with Black Goat Hair and a plain lacquered handle designed by Rick Glawson. Japan Co..
Japan Color-Brush Size 1"Japan Color-Brushes Size 1" are made with Black Goat Hair and a plain lacquered handle designed by Rick Glawson. Japan Co..